Technology, 10(01), 2019, pp. 1141-1158.
and not to the activity itself (Rose, 2013). dividing into manageable components such as area, size, zone, duration, etc. Team and other team members for understanding the WBS structure and purpose. (PWBS) and Zone Work Breakdown Structure (ZWBS). Breakdown Structure (SWBS) as its basic shipyard cost collection and analysis data structure. SWBS is the only firm-independent work breakdown structure currently in use in the U.S.
including maintenance, alteration and modernization (Koenig & Christensen, 1999). requirements, program scope, acquisition strategy, and other technical documentation. items can be manpower, hardware or software. basis of reporting criteria during project execution. subject to Program WBS oriented submission. three, four, and five-digit levels (Koenig & Christensen, 1999). offshore structures. It systemized of all ships components through a 3-digit coding structure. works as a cost work breakdown structure (Pal, 2015). record. This will increase the efficiency in the maritime industry supply chain activities. dimension, tolerances, form, materials and complexity of machinery types be specified. PWBS provides a uniform breakdown that is useful for progress monitoring and costing. are naturally linked to Zones Work Breakdown Structure (see next section 2.6). machinery, tools, etc. Expenses refer to designing, transportation, sea trials, etc. the PWBS three-dimensional dimension and their work relationship. building dock. Maximizing uniform workflow will give maximum productivity. accessibility, crane accessibility for material handling. and it will reduce final paint works (Y. Okayama, 1980). production line to start and stop production in a uniform and constant manner. verification data analysis with respect to the actual shipbuilding production. PWBS is required to depend on the actual result. will multiply with the number of products in the project to get the man-hours. data for similar Recipe X that employees prepared in the past. experts in the field to estimate the labour hours needed to create a product. make adjustments to man-hour estimates as necessary. made by many researchers to overcome such problems resulting from prediction by experts. and were not highly applicable at shipyards (Hur et al., 2013). not really accurate as it does not extend to detailed tasks. will have predicted the man-hours based on 3-month cycle activities. external factors of specific timing and environment is unknown. Figure 6 illustrated the manhours stages prediction at shipyard (Hur et al., 2013). guarantee the consistency of prediction. Fabrication Norms, a handbook for the oil, gas and petrochemical industries (Andrews, 1992). tool for modelling and in predicting the dependent variable which is normally continuous. CART is another prediction model based on a binary tree composed of several nodes. was actually used by expert in shipyards. Methodology of their research as shown in Figure 7.
performed a study to predict the man-hours by using conventional data collected at shipyard. and accuracy compared to SLR. their research for ANN is illustrated in Figure 8.
and require different controlling production management compared to mass production. Holm, Trostmann, & Conrad, 1993). by expert estimation and refined it for optimization. Proteus Engineering from U.S. produced Smart Product Model (SPM) (J. Ross, 2002; J. M.
displacement and type of power installed. items. Accuracy will improve once the design progresses to this stage. SPM software comprises two associated elements that focus on engineering and cost. cost element as described below. input related to ship requirement such as number of crews, ship type, payload capacity, etc. this SPM software, the man-hours can be defined easily for ship construction. multiplies the work difficulty (i.e. 1 for downward, 1.5 for horizontal, 2 for upward). In Figure 11 is shown the concept in CIM integration. User only defines first parts i.e. require greater period of historical data to reduce error in estimating using computer software. different error analysis between MLR and ANN without linking to WBS and ship product. was done by Mei (Mei et al., 2015) with respect to actual project. properties into this software as the base for historical data analysis. and Zone Painting Method (ZPTM). which is to define man-hours and cost. researchers still depend on conventional expertise estimation to develop their data analysis. 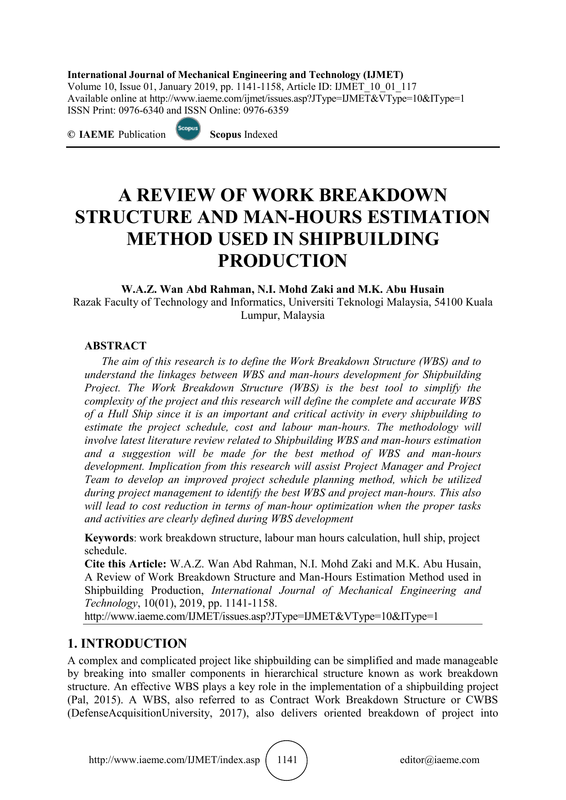 Shipbuilding Project by using PWBS method must be studied. the Oil, Gas & Petrochemical Industries, First edition 1992. Breiman, L. (1993). Classification and regression trees.RL:CRCPress. Work Standards (The National Shipbuilding Research Program). Acquisition University. Retrieved 19 September 2017. Ministry of Natural Resources & The Environment, Department of Environment, 2000. Gullander, P., Davidsson, A., Dencker, K., Fasth, Å., Fässberg, T., Harlin, U., & Stahre, J.
Jones, C., Jost, A. C., Perkins, T. K., Fleming, Q. W., Koppelman, J. M., Lipke, W., . . .
for shipbuilding. Journal of Shanghai Jiaotong University, 12, 1979-1983.
one-of-a-kind production. International Journal of Production Research, 54(3), 864-877. Guide)—Fifth Edition. Project management journal, 44(3), e1-e1. Ross, J. (2002). Forging a real-time link between initial ship design and estimated costs. Ross, J. M. (2004). A practical approach for ship construction cost estimating. Indirect Labor. Journal of Industrial Engineering, 18(5), 314-&. Sasaki, Y., & Sonda, M. (2002). A study on 3-D Digital mockup systems for shipbuilding. Journal of the Society of Naval Architects of Japan, 2002(192), 707-712. Concepts, techniques, and applications in Microsoft Office Excel with XLMiner. update. Journal of ship production, 16(1), 60-68.